In the most stressful of situations, it is easy to believe that we will act with heroism, ethical integrity, and a general sense of the PLUR (the flower power of the 21st century). However, this is the story of how I learned that our own (my own?) ethical constructs are more fluid and more subject to influence than I had ever believed. And this fluidity or even abandonment of moral standards (in a modeled setting) is amplified by a mob mentality. Now this may sound pretty intense; I would like to preface this by saying I realized that I had the potential to be capitalist snake in a closed, modeled activity that involved no crimes against humanity. This past summer I participated in a summer program called SHAD, where I lived on campus at one of the host universities (in my case, University of New Brunswick) for four weeks with a group of almost 70 Canadian students from all over the country. The program was mainly focused on empowering youth by providing a variety of experiences in areas of science, business, leadership, and entrepreneurship. Nearing the end of my month on the East Coast, our group took part in an activity that brought with it some major discovery, but not without the undertone of some shame as well. To make this story a little easier to understand, please bear with me as I explain the activity. The parameters of the activity itself, and our roles within it, were meant to model the roles of people and corporations through the processes of industry: processing, marketing, etc. The 70 of us were assigned one of 4 roles, and we began our duties with a small sum of Monopoly money to complete our tasks. Manufacturers (that was me! ): bought materials from processors and used the materials to create various products with the help of paper clips. Consumers: bought ready-made products from manufacturers through a barter system. The activity was played in rounds, where the room exploded into chaos as we bought, sold, and traded materials and products, frantically trying to increase the heft of our Monopoly cash wads. The mediators of the game would announce the changing preferences of the consumers throughout the activity (ie. “Blue squares are very ‘in’ right now!”, “Consumers are avoiding circles as a recent study has proven they are choking hazards”, etc. etc), and as a manufacturer, I scrambled to meet their needs. It seemed to me that the activity would prove to be a simple exercise in supply and demand, and within the first minutes of the activity, everybody was settling into their roles. By the first half-hour, however, everyone had tunnel-vision. I was in manufacturing overload. I sought to buy my materials quickly and efficiently, for the lowest price, regardless the quality. I bartered with the suppliers relentlessly, and slapped together paper and paper clips to present to my consumers. My cash doubled easily in the first round. My mind was locked in the cycle of output, output, output. As the rounds past, all the players were operating with a similar, focused mentality. Patents were introduced and people began applying for the right to tax other players on using certain materials, the right to charge people for wasted material, etc. Many people were searching for ways to generate profit by restricting other players’ powers, and the intensity of the game was amplified. Players would dump their waster on other players’ desks to avoid environmental fines, and soon those who left their money out in the open were subject to theft. The pile of products bought and discarded by consumers was growing, reminiscent of a landfill behind them. The mediators continued to periodically announce information to the group. It turned out that triangle products were considered radioactive. Blue was now unfashionable. We all seemed to pay less and less attention to the announcements if it did not give us information on how to sell more. As the game came to a close, our materials were depleted, all the paper clips used up. Handfuls of patent-holders were circling the room, demanding money for the most absurd infringements.The game to a close, and one play had gathered more than $19,000, starting from a few hundred bucks. The room was littered with paper, and there was even seemed to be some grudges forming among us, the people who had grown and bonded so strongly throughout the last couple of weeks. The mediators addressed us all. They reminded us that at no point in time had they said that the object of the activity was to collect as much money as possible. In fact, turns out our negligence of the radioactive triangle problem killed us all. As we were all pre-occupied with our own tasks, we failed to address a problem that, in this model, was the most destructive thing of all. Perhaps we figured someone else would do something about it- and yet all 70 of us didn’t. It might seem that this whole activity was a cheap trick to get us to feel bad, but I think it goes a bit deeper than that. To use the allegory of Plato’s Cave, I would say that before the activity, I, at least, was shackled to the idea that moral goodness was a sort of a default. And yet in the model, I acted with the classic kind of corporate greed, self-interest, and disdain for the environment which we usually deem to be objectively bad. These are actions that I would criticize others for, and yet I embodied them. This experience led me out of the cave, allowing me not to realize a greater wealth of knowledge on the outside (as in the original allegory), but allowing to realize a capability I didn’t know existed, a way of being I couldn’t fathom completely. I learned that ‘moral goodness’ takes will and conscious decision. What we call ‘corporate monsters’ in the real world aren’t born capitalist snakes, we all simply have the ability to make immoral decisions, but what sometimes is harder is to curb them. If I were to return to the cave, I believe I would have difficulty convincing my fellow cave-mates of such an experience, as they too would probably like to believe that my own described behaviors would be simply uncharacteristic for a ‘good, moral person’. And yet, as the ‘enlightened’ cave person, it is impossible for me now to not consider the ramifications that these types of actions would have in the real world. I’m not convinced now that I’ve been raised a monster and will corrupt the world with my newfound abilities, but the experience has allowed me to step out of my normal setting of thinking, to take a look at what is frightening possible. If it’s possible in a model, why not in the real world? And that’s a bit of a scary thought. I watched an interesting video a while back talking about incentive systems and how its badly set up for the US government. Reading this reminded me of it. Even though it wasn’t told to you that the goal of the game was to make the most money, you went after that and I’m curious as to what caused that incentive. Competitive nature, lack of consequences, or general pre-determined assumptions? 1) you ARE a snake, Emma. 2) although your reptilian nature worked against you, I really admire the introspective qualities in this post. It draws us in and makes us question ourselves – would we be as snakey as you, given the right circumstances? 3)**this one is more serious** Do you think that this ‘mob mentality’ and over-arching greed is part of the human condition? 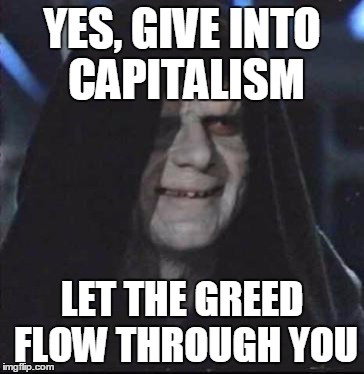 Do you think that capitalism is a symptom of inevitable human greed, or that the relentless thirst for resources/ money is a symptom of our highly capitalistic culture, society and upbringing? You ain’t actually a snake, this was a great post. Or… if we zoom out, are there any aspects of “human nature” that are inevitable or unavoidable? Is not one of the essential elements of our nature our ability to be reflective, to reason, and be critical of our actions (past, or present)? And does this not assume that we have much more control over our actions (especially when they may negatively impact others) than we might otherwise be willing to admit? Thanks for the comment! From a biological and evolutionary standpoint, I think that greed (let’s define that as a selfish desire for something) as part of the human condition is a reasonable claim. Today we don’t have to worry about the fight for survival as much as our Neanderthal ancestors did, for example; for the Neanderthals, looking out for themselves and concerning themselves with only their own safety and nourishment was incredibly crucial. In our North American society, perhaps this ‘survival of the fittest’ mentality that is biologically ingrained in us has changed its subject from food and fundamental needs to more capitalistic focus. As we grow up, we often receive implicit and explicit messages that money and success go hand in hand, which is probably one of the reason that my SHAD group got so wrapped up in the cash. What I’m saying is that humans are wired to want to survive, and without environmental pressures like lack of food or shelter, our society defines what ‘success’ or ‘survival’ looks like (aka resources n’ $$$). To answer more of your second question, I think it’s safe to say that the capitalistic system was not imposed upon us, but rather we created it. And with that in mind, the system has to stem from something human, whether that be greed or a thirst for power that comes with obtaining money and resources. However, as Mr. J touches on in another comment here, I think the this means that were are ultimately responsible for the system we create; for example, we cannot make unethical business decision and blame it on ‘human nature’. Perhaps the survival of the fittest mentality is still alive in us humans, but we’ve also developed, as Mr. J mentioned, an ability to assess our own actions. So for me, he question goes, to what extent does this moral reflection impact our day to day decisions? Are we willing to disregard it in the name of feeding our own ‘needs’ pertaining to the capitalistic system? Is this a conscious or unconscious choice that is taught to us?